Please see the complete description to the right of each title to learn more details. Also be sure to check out the related books below each title. Enjoy! The Second Edition is Available! 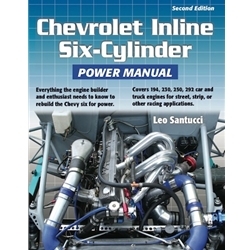 Crammed full of all the things that made the original Chevrolet Inline Six-Cylinder Power Manual the bible for new and experienced six-cylinder engine builders, this updated version is a must-have for any serious inliner. From soup to nuts, when you want to build the Chevy six for more power and torque than the factory could ever imagine, there is only one book the experts turn to. And now the second edition is absolutely jam packed with the latest blueprints, interviews, airflow charts, build sheets, racer and "hot dog" profiles. Thought-provoking ideas will help you build the Chevy six your way! 224 Pages, over 600 photos, drawings and charts! Please visit your favorite retailer to purchase. Leo Santucci has been building and racing six-cylinder Chevrolets for the past 40 years. He has researched everything written on sixes during that time. 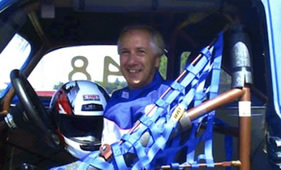 You will benefit from his interviews with many six-cylinder heroes including Glen Self, Cotton Perry, Mike Kirby, Al Weiss, Rob Harrison, Frank Duggan, and the late Kay Sissell, Jim Headrick, and “California Bill” Fisher. © CaliforniaBills.com 2010. All Rights Reserved.